Ask Bradley to look back at pivotal moments that shaped the advisory business and he recalls May Day 1975, the day the SEC deregulated commissions. 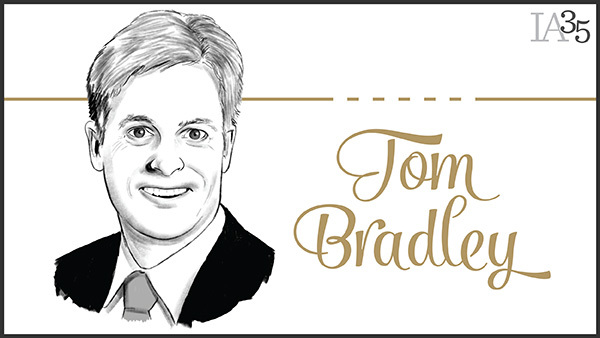 Ask Tom Bradley to look back at pivotal moments that shaped the advisory business and he recalls May Day 1975, the day the Securities and Exchange Commission deregulated commissions. “Two industries came out of that [deregulation]: discount brokerage and the independent registered investment advisor business,” Bradley said. During his 30 years at TD Ameritrade, in which he’s steered both the retail and institutional businesses, Bradley has watched two major trends unfold: the role technology has played in reshaping the investor/advisor relationship, as well as investors “flocking” to what he calls the “newer” advice model—fiduciary, fee-based advice. “We’ve gone from a straight-up ‘Call us and we’ll write up a trade ticket’ to what is being referred to today as omni-channels; you can still call us [and] walk into a branch,” Bradley said, but clients can now go online or use a mobile device to do business with TD Ameritrade. In fact, mobile is “one of our fastest growing channels,” he said, representing more than 15% of TD Ameritrade’s daily trades. Bradley said the discount broker’s two fastest growing businesses are around the advice channel. “We have folks that like to trade, but we also have folks who are more long-term investors.” The firm offers two products and services for each—TD’s advisor referral program, AdvisorDirect, as well as Amerivest, which provides investment portfolio management solutions for the mass affluent. AdvisorDirect, through which TD refers high-net-worth investors to registered investment advisors, launched in the mid-2000s and now refers $30 billion in assets to RIAs every year, Bradley said. “The asset close rate is in the 25% to 30% range,” with the average account size being more than $1 million. Amerivest, TD’s investment portfolio management solution for the mass affluent, which serves individuals with at least $100,000 to invest, currently measures about $11 billion in assets—“that’s up from $2 billion only a few years ago,” Bradley said. Amerivest, TD’s “fastest growing business,” is the “closest thing” TD has to a robo-type service offering, Bradley said. The second fastest growing is the discount broker’s independent advisor services business. As to the Department of Labor and the SEC’s efforts to change the definitions of fiduciary, Bradley said that TD is “evaluating” the DOL’s recently released redraft of its rule to amend the definition of fiduciary under the Employee Retirement Income Security Act. “I think all eyes are on fiduciary and how we deal with that,” Bradley said. With any fiduciary rulemaking, “you still want to maintain the rules under the Securities Act of 1934 that essentially governs stock brokers; you want to make sure that we maintain the ability to go out there and raise capital by selling securities to investors,” Bradley continued. But “you also want to make sure we maintain the choice that was created under the Investment Advisers Act of 1940, […] governing investment advisors, which says that if you’re providing pure investment advice, that should be done as a fiduciary; you don’t want to water down or eliminate either one of those” Acts.